The Astronomik Deep-Sky RGB 31,8mm filter set is designed for maximum deep sky imaging performance with CCD monochrome cameras, providing you with the highest-quality data for amazing images with unsurpassed sharpness, contrast and vivid colors. Composed by 3 31,8mm filters that threads directly to 31,8mm nose or filter wheels with 31,8mm filter connections (with m28 thread). 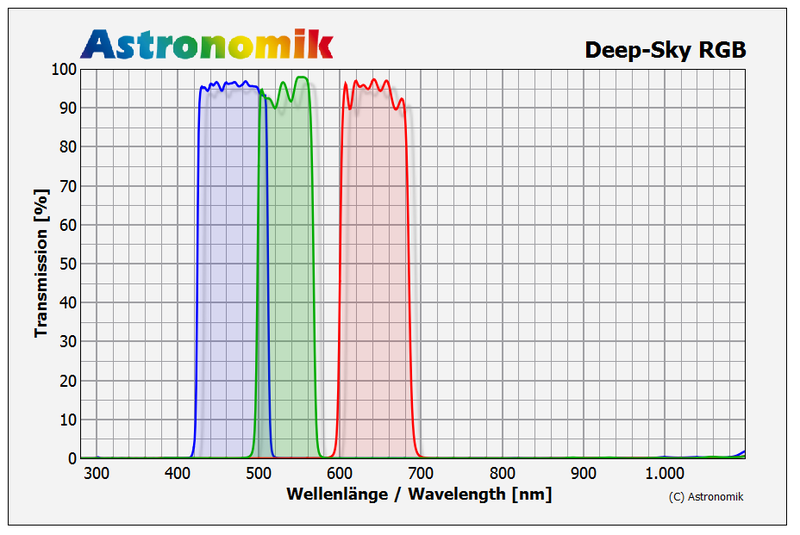 During the design of the Deep-Sky RGB filters, Astronomik took a close look at the sensitivity curves of today’s popular CCD cameras. The result was they found a way to make one set of filters for all kind of sensors ranging from KAF- and KAI-sensors, to the chips made by Sony, meaning you can do 1:1:1 ratio RGB exposures with all sensors, with only minimal tweaking necessary during processing to achieve perfect colours in your image! The transmission curve characteristics and coatings on the new Deep Sky RGB filters have been designed and engineered in such a way that no halos or reflections will be visible. Even with bright stars in the field of view you will be able to reveal the faintest structures in nebulas or galaxies. Additional to the Deep-Sky RGB filters Astronomik now offers you three different Luminance filters. The different spectral window of each new Luminance filters is designed to tune your setup to get the sharpest image from any optical design and any camera, even with instruments with less-than-perfect colour correction. Like all Astronomik Filters, the new Deep-Sky RGB filters are made using an extremely durable and scratch resistant coating, deposited on the finest polished optical substrate, which is free of any striae or internal strains. All substrates are made to exactly the same thickness, so all of our filters are parfocal. If your observing site suffers from light pollution you should try to use CLS-CCD as a replacement for the Luminance filter. The transmission curve of the CLS-CCD will give you approximately the same amount of energy in all three colour channels while blocking nearly all unwanted arifical light pollution. Customers who replaced the Lx filter with the CLS-CCD are amazed by the increased quality of their data. This small change gives you the opportunity to take much deeper images from your current observing site.